A 2-month-old boy was well except for slow feeding. A II/VI systolic murmur was heard at the left sternal border and back. 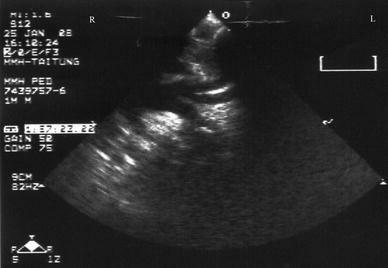 Echocardiography showed dilatation of the left ventricle and coarctation of the aortic arch (Fig. 1). Computed tomography with a 64-slice multislice CT scanner (Toshiba Aquilion, Japan) yielded volume rendering showing the great vessels posteriorly (Fig. 2). 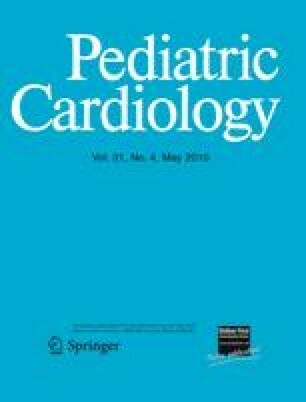 The ductus arteriosus was closed. 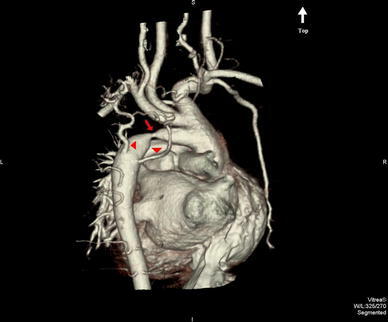 The ascending aorta gave rise to three brachiocephalic vessels, ending after the third. A separate vessel arose from the ascending aorta, traversed inferior to the transverse arch, and connected to the descending aorta. The diagnosis was a fifth aortic arch with segmental coarctation at that arch (Fig. 2; arrow). Two collateral vessels from the left subclavian artery ran to the descending aorta (Fig. 2; arrowheads). End-to-end anastomosis between the descending aorta and the orifice of the fifth arch was performed, and the patient recovered without incident. Persistent fifth aortic arch was first described by Van Praagh and Van Praagh . Multislice computed tomography can demonstrate good images in this case.